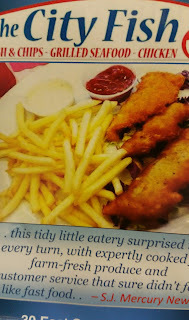 This little fish and chips place is located in downtown San Jose, CA. The place isn't very large and the location has plenty of "interesting characters" milling about outside, as it is downtown San Jose! While the food is certainly four stars IMHO, especially for the value, the decor size and location take it down a notch. Also make sure you park in a nearby parking garage so as to get validated for parking, otherwise you might be paying around 4-6 bucks extra for parking. Essentially you order at the counter and then find a seat, the food,and sauces, are brought out to you. You aren't really "waited" upon, but we decided to tip regardless. On the menu they have separate options for panko bread crumb as well as other options for salmon, and other fish prepared in the traditional batter and deep fry style. You could also get those fish pan fried, baked, etc., but those were typically the same price as you would think to pay at a upscale fish restaurant, so were a bit pricy. 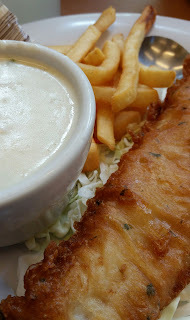 I opted for the Fish and Chips + Chowder combo for my first foray into the cuisine here, not knowing what to expect in terms of batter or flavor. It was right around ten dollars in cost. As you can see in the pics the batter isn't like you would find at an english pub, so thickly coated that you need a knife to cut into the fish, but a delicate and flavorful batter that flakes away with the whitefish underneath. 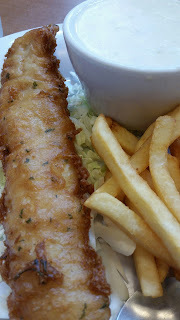 It is almost as light and crispy as the tempura batter that my favorite place uses, Tugboat Fish and Chips. 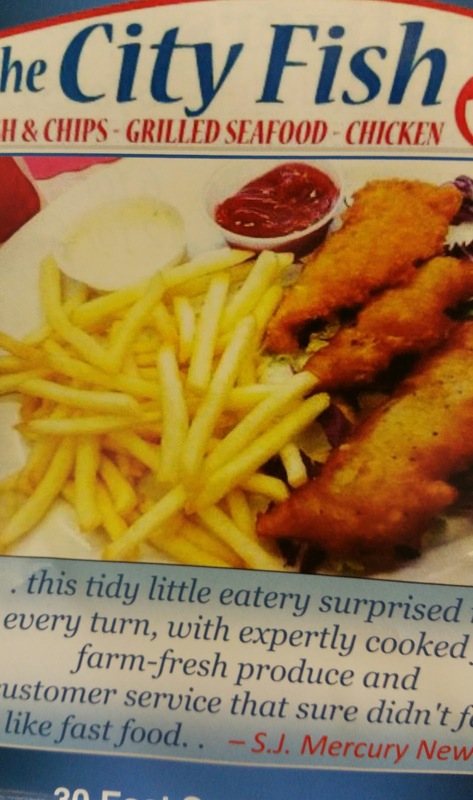 The fries are your typical faire. The chowder on the other hand was very good! The chowder was on the thinner side, creamy yet soupy, with plenty of clams and other ingredients, and not over cooked to where the potatoes just disintegrate and thus thicken the soup, which is a good thing! The chowder alone is something to seek out. This is a place that I'll certainly come back to for a fish and chips fix, especially since its a bit closer to my work/home.